UPDATE 1:05PM MAY 27—Yang has been released on electronic monitoring, according to a sheriff's office source. 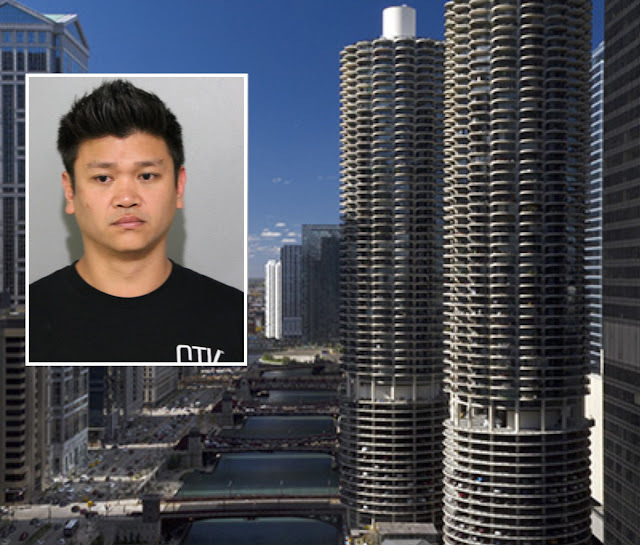 A man who opened fire on the downtown neighborhood from a condo balcony at Marina City early Thursday is in custody, charged with multiple felonies and weapons violations, police said. No one was injured in the incident. Joshua Yang, 32, was arrested on the 37th floor of the west tower at the iconic “corn cob buildings” at 300 North State around 3:30 a.m. Sporadic reports of shots fired were made by police and citizens in the Loop and River North over the course of about ten minutes before officers found a witness who pinpointed the balcony where the gunfire was originating, police said. Cops relocated to the suspected apartment and found Yang, holding a handgun, along with a second man, police said. Police ordered Yang to drop the weapon and lay on the floor. He complied and officers took him and the second man into custody. Yang is charged with felony reckless discharge of a firearm; felony unlawful use of a weapon by a felon; misdemeanor possession of a firearm without a Firearm Owner ID card (FOID); and misdemeanor possession of ammunition without a FOID, according to police. Yang has been released on electronic monitoring, according to a sheriff's office source. The second man was released without being charged, police said. According to a former resident of the west tower and images included in a rental listing, Yang’s apartment balcony faces almost due west over the Westin Hotel and down the Chicago River. Support CWBChicago for as little as $49 a year or $5 a month. May's member’s only perks include first-quarter crime performance reports for North Side neighborhoods and summer safety tips.